Between the world we see and the things we fear there are doors. We open these doors to allow the spiritual realm to mingle with the physical one. 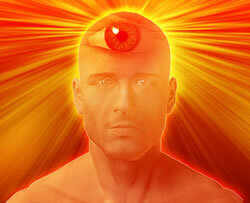 The gift to communicate between these two worlds is called a sixth sense or a third eye. Within each person lie special powers that are only waiting to be unleashed. Physic abilities come easily to some but for others, it requires more effort. With increased interest in the psychic world and the paranormal, people want to delve into the unknown. The psychic world revolves around many different aspects, like clairvoyance, mediums, psychics, fortune tellers, astrology, and the list goes on and on. To become involved you must first find where your strengths are. If you tend to have an intuitive nature that something is about to happen, you should harness those abilities and strengthen them. People have become less fearful of what lies ahead and are looking to a higher power to discern future events. The theory by some is that spirituality or psychic abilities are associated with the dark side. However, curses and the occult have nothing to do with true psychic abilities. This muscle is something that resides in every one of us and only needs to be utilized to increase its power. When you connect with a higher power through your spirituality; you will open yourself up further to your spiritual sense. Being psychic usually runs in families. If you have a mother or grandmother who has this gift, it is typically passed down. Some know they have special powers from an early age while others find their powers begin to develop after a tragic incident. It is made out to be a complicated matter and a pinnacle that only so many people can reach. It doesn't take a lot of efforts, but you must let go and allow the spirit world to communicate with you. Here are some tips on how you can tune your spiritual sense. One of the biggest parts of your spiritual journey is to release any negativity that is around you. This negative energy can be people, places, or things. Surround yourself with positive energy. Even if your psychic journey doesn't get any further than this step, you need to release the negativity for a happy life. Keeping your mind clear will allow it to open to positive things. It seems the spirit world likes to work through children, as they are open oracles just waiting to be used. They haven't been poisoned by the world yet. Your first impression is usually correct. Have you ever heard an alarm in your head about something and disregarded it? Have you ever felt that you should avoid a trip or take another turn down the road and found out later that it saved you from an incident? This is all part of tapping into your psychic abilities. We often realize too late that our first impression was the one we should have listened too. Our gut instincts are the ones that come to us through a flash of emotion. It's important to listen to these intuitive messages if we want to become more psychic. Ask yourself why do you want to develop your psychic powers? Do you want to pick the winning lottery numbers, or do you want to help others? First, as you embark on this journey, you must know that you cannot be a psychic to yourself. If your motivation is to win the lottery or gain fame and fortune; you have the wrong motives. You will develop great instincts that can be used to help you out, but your gift is to help others. It's for you to share with others, not for your personal use. If being a psychic meant you could pick the winning numbers or know which scratch off lottery ticket was the winner; psychics wouldn't have any hardships. You can't have the idea that if you take care of someone they will take care of you. There are some assurances through your spiritual nature, but being psychic isn't going to protect you or make you something great. In fact, when you open yourself up to the spiritual realm it's a whole different ballgame. With good feelings also come bad, and there's no way to know what's going to come through and where. If you want to learn to do readings, begin by practicing your art on friends. Trying to read people that are really close to you oftentimes is complicated by emotions. We can read into a situation what we wish rather that what is truth. Psychics are nearsighted because they can see upcoming events. The person you give a reading too is farsighted. They only see their past and the ultimate goals that they have in mind. You cannot edit someone's life and what is in their heart. All you can do is be an objective reporter of what the spirit world is telling you. You have to learn to ask questions to your spirit guide within your mind. Ask about finances, medical issues, relationships, and anything you can think of. Having a spiritual nature means being able to ask and receive the answer to your question. You need to learn to freely communicate with the other side to be able to provide answers for people on this side. When you ask the spirit world for answers, they aren't always going to answer right away. Sometimes you have to be quiet and wait. If you know you have a reading coming up, ask questions to the spirit world in advance such as: how is their health? Have a pen and paper ready and write down the first thing you hear or the feeling you get. Don't think about the answer, just write it down. Say it out loud too. Whatever your first impression, no matter how ridiculous you think it may be; just go with it. Think of yourself as a portal that relays information from the spiritual world to the human world. You must learn to be unbiased, straightforward, and not afraid to provide both warnings and solace. Even the best psychics have times when they are wrong. If a person denies what you tell them, just agree and go on. Sometimes the answer that you gave the will be something they face three months down the road. Sometimes you may pick up on things that are for their future. Maybe they're not fighting a health battle at the current time, but your spiritual sense is picking up on a warning of things to come. It's a big smack to the ego when you are incorrect, or at least, when the client things you are. However, even the best psychics cannot be right 100 percent of the time. Shake off the bad readings and move on. There will be more good than bad; especially as you hone in your art. Before you start down this path, make sure this is what you really want. Many people romanticize dealing with the spirit world but it isn't always a cake walk. There are times when you get nothing from the spirit world, or times when it doesn't seem to want to leave you alone. When you open yourself up, you must be willing to not only take the good but also the bad. Sometimes during a reading you will be telling the person that they are going to find the person of their dreams and live happily ever after. However, there are sometimes when the spirit world shows you that this person is going to have a tragic ending and perhaps their life will be shortened. You cannot control the messages, you just must relay the information you've been given. You must learn to do so with tact so that you don't induce a panic. The reason the spirit world shows us things is so that we can give them a chance to make changes for a better outcome. Being spiritually sensitive has its perks, but it is a gift that must be used with care. By following a few basic steps, you too can develop your psychic abilities.